Article by Nikola Petrov for the "International Survey: Bulgaria-Italy" of Novinite.com (Sofia News Agency). 2012 will mark the 100th year since the death of prominent Bulgarian poet Pencho Slaveykov who spent the last days of his life near lake Como in Italy. His death might have prevented him from receiving a much wider recognition in the international history of literature, as in 1912, he was nominated for the Nobel prize which is only given to living authors. However, Pencho Slaveykov still serves as a source of inspiration for Bulgarian intellectuals, as he was one of the first who connected the country's literature with the Western European cultural heritage, while remaining deeply connected with the Bulgarian traditions. Slaveykov led an intriguing but difficult life. The youngest son of another famous Bulgarian poet, Petko Slaveykov, he was born on April 27, 1866, in the town of Tryavna. In the winter of 1884, he suffered an accident which changed his life forever. After ice skating, the young Slaveykov fell asleep on the iced Maritsa river and subsequently fell ill. Despite lengthy treatment in Plovdiv, Sofia, Leipzig, Berlin and Paris, he never fully recovered and the illness left him with serious impairments — he could not walk without a cane, and he wrote and spoke with difficulties. The author often suffered from melancholic episodes but, as he himself pointed out, the pain also helped him strengthen his will and inspired him to strive for enlightenment. Slaveikov's aesthetic taste bears the marks of his thorough acquaintance with the works of Goethe, Heine, Kierkegaard, and Ibsen. This general perspective allowed him to look at the cultural and political life of his native Bulgaria with the eye of an outsider. The fact that the poet's vast range of influences also included the Italian cultural heritage is no surprise - Michelangelo Buonarroti, the world renown Italian Renaissance painter, sculptor, architect, poet, and engineer, was one of the cultural figures which inspired him, and he included a poem dedicated to Michelangelo in his Philosophical Poems (1896). This cycle also included works portraying Prometheus, Beethoven, and Shelley. By exploring an individual's inner world, Slaveykov's poetry marked the beginning of a new epoch in Bulgarian literature, previously committed to causes: religious, national, political, and social. In other words, before Slaveykov's generation stepped in, the literature in Bulgaria served mainly utilitarian purposes, while he and some of his contemporaries started exploring the spiritual life of the individual. The driving force behind Slaveikov's criticism of the existing literary establishment was his view that an artist's moral values and sincerity would not make for a lack of talent, a view which connected him with the aesthetics of Western Europe, including Italy, at that time. In 1898, Slaveykov joined the Misal (Thought) circle with a number of other prominent intellectuals, including literature theorist Krastyo Krastev, poets Petko Todorov and Peyo Yavorov. The circle existed for almost 15 years and "intellectualized" most of the country's cultural life during the period. 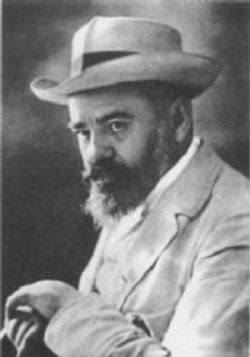 Slaveykov also served as director of the National Library of Bulgaria (1909–1911) and a director of the Bulgarian National Theatre (1908–1909). The poet traveled a lot in that period - he visited Moscow, Istanbul, Athens, Naples, Sorrento, and Rome (1911), where he studied the development of libraries. In 1911, he left Bulgaria after being fired from the post of director of the National Library because of political conflict with the minister of culture Stefan Bobchev. He resided in Z?rich, Lucerne, G?schenen, Andermatt, Lugano and other places in Switzerland before arriving in Italy at the end of November 1911. He remained in Rome for three months, but set off in May 1912 to travel through Florence, the Engadin and the mountains looking for a cure for his physical suffering. At the end of the month he arrived in the small town of Brunate near Lake Como. On May 28, at about 10:00 am, Como's doctor Barancioni arrived at the Belavista mansion, where Slaveykov was residing, only to find the poet unconcious on his bed with the love of his life, Mara Belcheva, sitting close to him. Later that day, Slaveykov passed away. Belcheva did not have enough money for a funeral - but as condolatory letters started arriving, the owner of Belavista understood the poet is an important figure in Bulgaria. Slaveykov was buried in Brunate's cemetery in 1912 and his remains were moved to Bulgaria in 1921. In 2007, a monument representing the poet was raised in Brunate. in its dark and quiet depths. are startled by a shed-leaf-trace.